A STRONGER UMNO, WEAKER BN? It seems whatever goes wrong in the country, the blame must be put on UMNO. While it is a normal practice for UMNO to be the whipping boy of opposition parties, the action by BN’s component parties particularly MCA in directing their vitrol at UMNO is unwarranted, if not lack of partisanship. The latest come from their former president, Dr Chua Soi Lek- arguably the most under performing president in MCA history. His remarks that UMNO, under the leadership of Tun Dr Mahathir has made its coalition partners to become powerless in BN. In short, a stronger UMNO has to be blamed for the MCA’s dismal performance during the last general election. Not only he has faulted Tun Dr M for overbearing UMNO, the much maligned New Economic Policy (NEP) was seen as a reason why the Chinese community has deserted MCA. Obviously his remarks require closer scrutiny. Firstly, a strong UMNO will not make a strong BN nor a weak BN. A united Barisan Nasional is. 21 years as a BN Chairman, Tun Dr Maahthir has successfully ensured a united coalition thus resulting not only a strong UMNO , but the politically-strong component parties as well. If a stronger UMNO means a weaker BN, can Dr Chua explains why the best election performance for MCA in BN was during Tun Dr M’s leadership? In 1982, MCA won 15.5% from the total seats. In 1995, it was 15.6%, and 1999 (14.5%). Later, in 2004 election where UMNO at its best, MCA obtained 31 seats- the highest ever. Unless the calculation is wrong, maybe Dr Chua can shed some light on this matter. But remember, number don’t lie. Secondly, it is sad to see Dr Chua is no different than Lim Kit Siang in condemning NEP. His assertion that NEP has caused the Chinese losing faith in the Government is contradicted to himself. He acknowledged for the past 4 years the Government has been pushing for the liberalisation of economic policies. The question is, why the Chinese community still not supporting BN in particular MCA despite of we are moving towards the NEP-free economy? The truth is, it’s not about a strong UMNO or not. The fact remains, the DAP dangled before the Chinese the possibility of political power could be wrested from the BN and the opposition would form the next Government. If leadership is defined by accountability then surely the president of component parties should be blamed for not doing enough to convince his party members about power sharing concept between parties. Instead, he shared the same belief with his opponent to blame MCA’s longest partner (UMNO) and their common economic policy (NEP). If the leader is lack of partisanship, what more can we expect from its member. No wonder under Dr Chua’s leadership, the MCA has won only 3% of the total seats. It must be due to many non-Malay supporters of the BN component parties withdrawing their support to BN. Actually a stronger UMNO is good for BN. Prior to 2008 election, undeniably there is more harmony and unity in BN coalition than there is in most unitary parties in Malaysia. There can be no denying that the strength of the UMNO plays a major role in keeping the BN parties together. A weak UMNO would not have succeeded in attracting partners. If UMNO has only one partner, defection by the partner would bring the UMNO-led government down. But there are many partners and defection by any one partner would not affect the BN’s majority. This defer parties from defecting as their joining to Opposition would not give the latter a majority to form a government. This explains why there was a tacit acceptance that UMNO was first among equals. 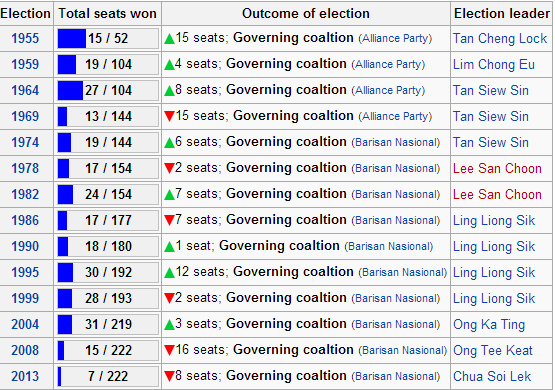 It’s not about Malays dominant, rather it is a factor that brings stability and continuity to the coalition. The new MCA leadership should understand this very well. Blaming UMNO would not bring support for them. It would be better if they start convincing their own supporters about the concept of power sharing between the UMNO and component parties. Kajang by-election could be their starting point. I cannot agree more with Mr Rodi. However sorry to say this as some of my closest friends are Chinese, but now I see they are very thirsty for power but the party representing them in the coalition has not really been able to convincing them of the power sharing in the past do prosper them even during the time Tun M…. Perhaps, the esteemed Dr. Chua would need to reassess his statement. It has been the failure of the elitist MCA leadership that has lost the confidence of the chinese voters. Made worse by the fact that MCA decided to re-elect a President who stepped down because of a moral issue. This very issue was a major bone of contention and an easy mark for the Opposition. The elitist MCA leadership also failed to convince their own people that there is more to be gained by a stronger BN. It is on MCA themselves to correct these issues, create the awareness of a morally righteous party under new stewardship that can bring immense benefit to the people. Put into effect a strategy that affects and benefits the most people, particularly in the current economic conditions.